Not long ago, Mediasoft Entertainment™, Malaysia's biggest digital entertainment studio is proud to announce the future of sports gaming: with the World's No.1 badminton mobile game Jump Smash™ 15 being launched globally on Android, iOS and even on Windows App Store. The Jump Smash™ 15 is one of the latest release in the popular badminton sports franshine by Mediasoft Entertainment™. 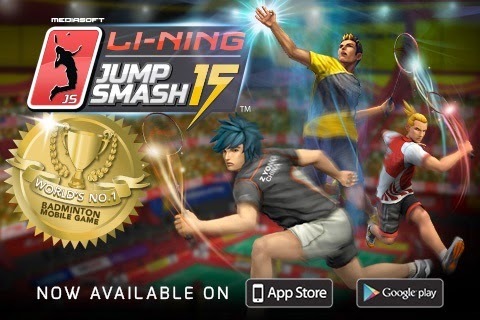 I have been told that this sports game, Jump Smash™ also being partnership with international sport brand, Li Ning. The Jump Smash™ 15 has utilise a simplified and intuitive gameplay model where the characters will react contextually to the gesture-based user interface that mimics real-time badminton movements. Audiences will experience badminton like they never have before with game features such as customisable characters, PVP and tournament mode. Not only that, you also able to play either in singles or doubles mode, with your friends, in Tournament or Multiplayer mode or against the AI in Exhibition mode. By earning the JS Coins or JS Gold as you play and use that to improve the stats of your player either in training mode or by buying better equipment at the JS Store. Individualise and train each skill point and keep playing to become the next Jump Smash Champion! Moreover, I been told that there will be e-Tournament of Jump Smash™ 15 soon and a lot of cool prizes to be won. Lets start train training! If you wanted to know more about the game, you able to watch the trailer of the Jump Smash™ 15 as below. For the latest update on Jump Smash™ 15 on http://www.jumpsmashgame.com/. Not only that, if you using other social media platform you also able to follow them too.